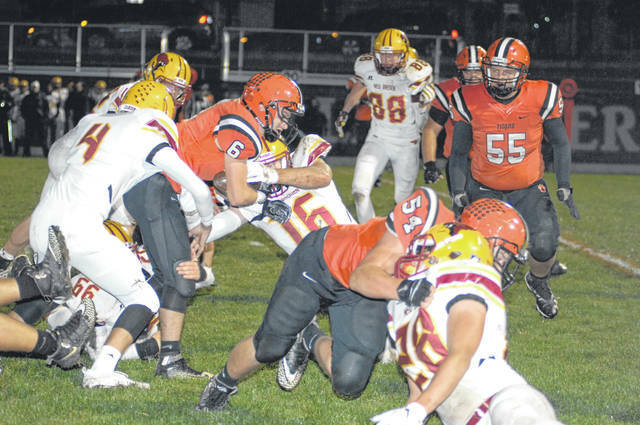 Versailles ball carrier Jake Poling (6) gets wrapped up by several New Bremen defenders during their Midwest Athletic Conference battle on Friday night. New Bremen won the game, 14-7. 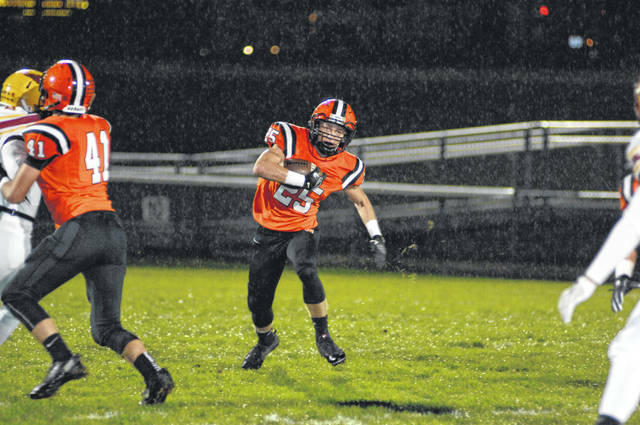 Versailles’ Nathan Wagner (25) looks ahead for some running room during a Midwest Athletic Conference battle with New Bremen on Friday night. New Bremen won the game, 14-7. Versailles’ Ryan Martin (11) tries to escape the grasp of a New Bremen defender during a Midwest Athletic Conference battle on Friday night. New Bremen won the game, 14-7. 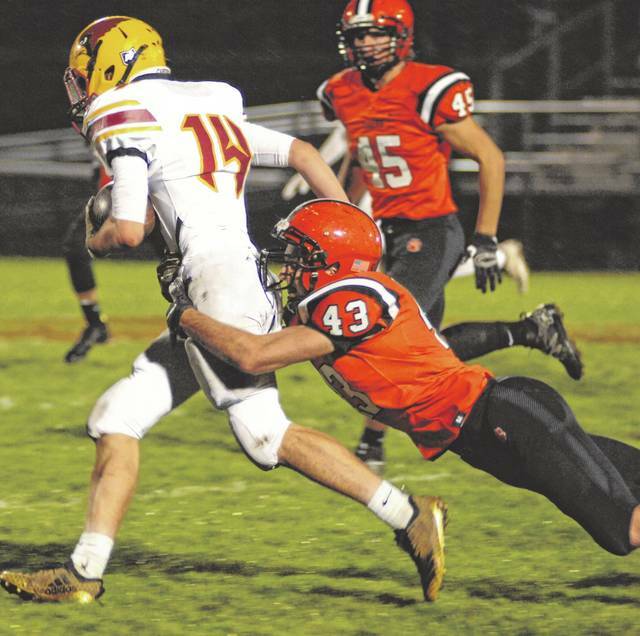 Versailles’ Tyler Henry (43) makes the tackle from behind on a New Bremen runner during a Midwest Athletic Conference battle on Friday night. New Bremen won the game, 14-7. 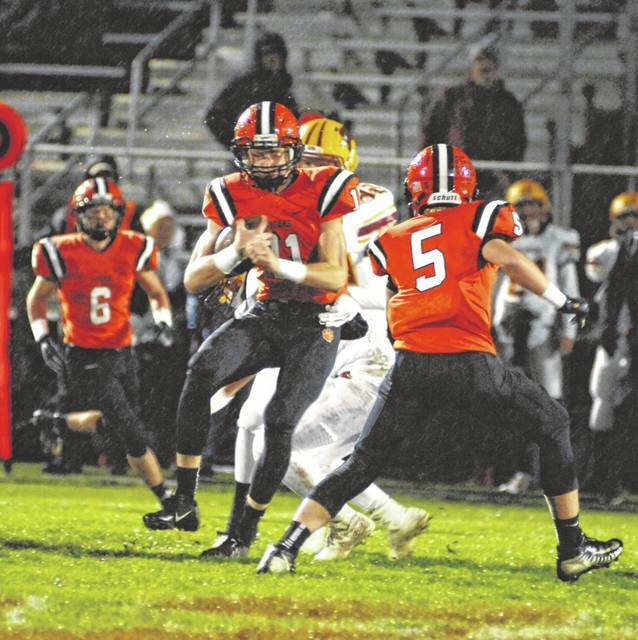 VERSAILLES – Going into Friday’s game the Tigers had never lost to New Bremen. After Friday night, the Tigers were no longer perfect. Leading 7-0 at the half, Versailles gave up two touchdowns in the second half to fall 14-7. The loss puts Versailles record at 2-6 on the year. The night started with the crowning of Homecoming Queen Tori Ahrens and King Ben Albers. From there, the game was played in rainy conditions. Both teams struggled to hold onto the football. The Tigers threw an interception on their first possession. New Bremen took over at their 29, and gave it back to the Tigers on a fumble recovered by Tyler Gigandet. The Tigers gave the ball up at the New Bremen 14-yard line. After they traded possessions, the Tigers Evan Hiestand blocked a punt after a bad snap. Starting at the Cardinal 12, the Tigers could only gain two yards before giving the ball over on downs. The Cardinals moved to the 25 before punting. The Tigers took over at their 39. They moved the ball to the 50 and Ryan Martin hit Michael Stammen for a 50-yard touchdown late in the second quarter. The extra point was good and the Tigers took a 7-0 lead. The Cardinals tied the game late in the third quarter with an 8-yard touchdown run. The drive was aided with a third down pass interference call against the Tigers. The Cardinals scored the gamewinner with a 50-yard pass of their own with 8:29 left in the game. The Tigers had a chance to score late in the game but threw back-to-back interceptions. The first occurred at the New Bremen 13 and the last one at the Cardinal 20. The Cardinals ran out the clock and secured their first victory over the Tigers. Neither team could get their offense moving. Both teams were held under 200 yards of offense. New Bremen had 159 yards of offense while the Tigers had 192 yards. The Tigers will host Minster next Friday night. The Wildcats are 5-3 on the season and are coming off a 7-6 loss to Marion Local.